Buy OnePlus One at ease without the invite system! Craving for the flagship killer smartphone, OnePlus One but cannot buy due to the invite system? Worry no more. For OnePlus’s first anniversary in the smartphone arena, the brilliant Chinese startup has announced that the OnePlus One smartphone will no longer be sold through the invite system and can be bought from all the supported regions. What’s interesting is that the decision of ending the invite system comes at a time when Xiaomi announced open sale for its smartphones in India. The open sales for OnePlus One will open globally with 75% discount on certain mobile accessories. The device boasts a 5.5 inch full HD Display and is armed with the 2.5GHz Snapdragon 801 CPU and a 3GB of RAM. At the rear, the phone packs an impressive 13MP camera and a 5MP one at the front. To keep the device rolling, it is supported by a huge 3,100 mAh battery enough to keep the phone running for long period. It seems the enthusiastic fans were actually expecting a OnePlus One sequel, however the initiative of abandoning the invite system is a good one nevertheless. 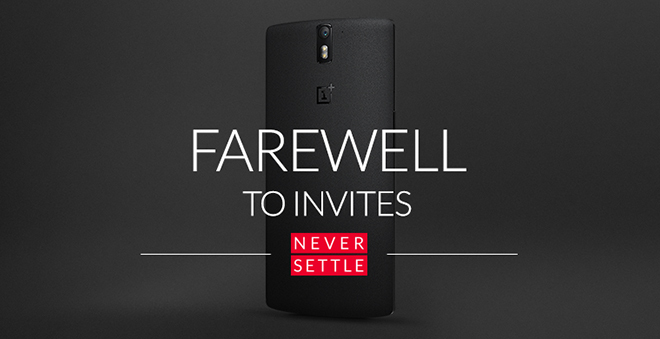 Since the OnePlus One will no longer have any invite-system, will you be procuring one? Let us know in the comments below!